We are a family owned and operated company servicing Florida’s Nature Coast with fast, friendly and affordable solutions for pest, termite and nuisance wildlife problems and we also provide excellent lawn spraying and fertilization services. Call us today and speak to one of our friendly, knowledgeable staff members. We can provide a free inspection and estimate or speak with you over the phone. We are different from our competition in many ways. Our super fast response time. If you have a pest or termite problem, in most cases we can perform an inspection, give you a quote and start the service the same day. We fully guarantee our pest and termite services. We are the only call you will need to make no matter what the problem and have peace of mind that your termite, pest or wildlife issues will be eliminated. Our termite services include a LIFETIME GUARANTEE. We design all of our services to be family friendly. We focus most of our efforts on the exterior where pests enter. From the products we use to our “not just pesticides” approach, your safety and elimination of your pests are our top priority. All of our employees undergo a full background check, full panel drug test, random drug testing and an annual driver’s license review. They also participate in multiple ongoing training sessions annually. Our office is in Spring Hill Florida on Route 19 just behind Golden Corral. Since we are local, we respond superfast. We also live, eat, shop and use local businesses in the areas we service thus giving back to our local communities. Our members live in Spring Hill, Brooksville, Hudson, Land O Lakes, Homosassa and Tarpon Springs. So before you call a huge, out of town company with a call center, give our local business a call first and we will show you the hometown difference! Superior Service and Affordable Cost. We work very hard to provide our customers with the very best customer service and treatment solutions in our industry all at very competitive and affordable rates. Our services begin with inspection and proper identification of the pest you are experiencing. We will discuss with you in detail our findings, ask you some important questions, listen to your answers and discuss our recommendations for treatment. 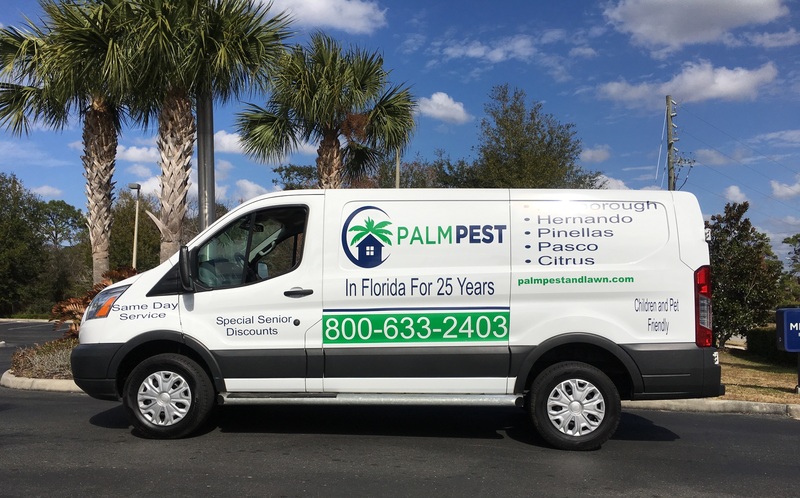 At Palm Pest, we understand each customer and pest problem is unique and our solution for each problem is unique as well. We will tailor a service to eliminate YOUR pest problem and we will handle your home or business with quality service and care. Our services include all the little important details that make a big difference.